Joseph was born in 1897 and the Census for 1911 shows him aged 14 living at Woods Cottages, Holt Lane with grandfather John, his windowed mother Margaret, sister Margaret and brother Arthur. His occupation is given as an apprentice file- smith. He enlisted on 28th January 1916 in Warrington and served as an Army Reserve until 15th April 1918 when he was posted to France with the BEF until 15th March 1919. On his return home he remained at Pirbright until demobilisation. Army records show that he was promoted to Lance Corporal on 20th June and discharged on 17th September 1919. ​In the early part of the 20th century, The Holt consisted of a collection of houses with the main occupation of the residents being watch and tool making. 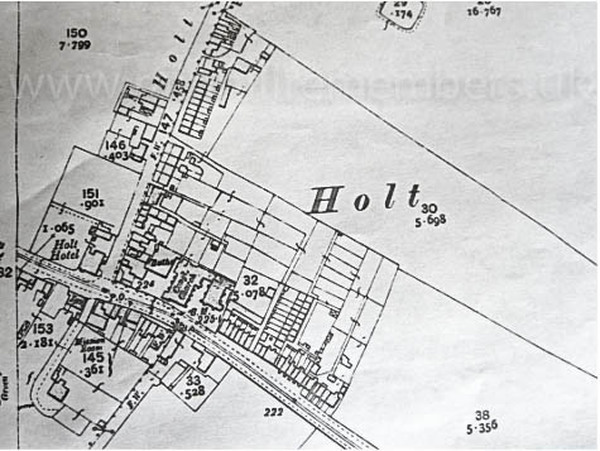 It is not known which group of houses were known as Woods Cottages but they would have been on the right-hand side of Holt Lane starting opposite the Holt Hotel. See above map.